Assassin’s Creed has had a bit of a bumpy journey since its original release way back in 2007, the initial game was fairly well received, the sequel and it's spin offs even more so and then took a hit with the rather disappointing Assassin’s Creed 3. So where does Black Flag fit in with all of this? If you finished Assassin’s Creed 3 you'll already know what I'm about to tell you, if you haven't, well...spoiler warning, Desmond dies at the end. If you feel like playing AC4, this gets dropped on you near the beginning anyways so you'd find out either way. Moving on, the game is set in 2 different timelines, the past and the present. In the current timeline you play as yourself, you are the latest person to be employed at Abstergo Entertainment, a company that is making the Assassin's Creed games, and in order for them to make their titles better, you are plugged into the Animus to walk in the footsteps of generations past lives. If this all sounds weird, think of it like the Matrix, if you haven't seen the Matrix...what's wrong with you? Go do that! So once you're plugged into the system, you get to control Edward Kenway, he's the father and Grandfather of the two playable characters in Assassin's Creed 3. Edward is a suave profiteer sailing the oceans of the Mediterranean Seas, who finds an assassin who's about to turn over to the Templars, runs him through and steals his clothes and all his equipment. You then hop aboard a ship and start sailing your way wherever you fancy in a huge open world with a vast ocean and plenty of islands to explore. While the story is well written, due to the game's structure, and the fact that you are given free reign right from the get go, it's very easy to get sidetracked and completely bypass it. If like me, you spend a lot of time sailing around and exploring, when you go back to doing story based missions, it's easy to forget who's who and why you are even helping them in the first place. Black Flag is now the 6th game to hit the consoles and while not much has changed gameplay wise, when it plays as well as it does, why would you try to break that? You play from a third person perspective and switch between sneaking your way around guards, performing complicated acrobatics to avoid them or shoving various pointy metal objects through them. The stealth elements are kind of lacking here though, you're either walking around or you're crouched down in a bush or hiding in the iconic series favourite, the trusty bundle of hay. Most of the larger islands have towers to climb which once you get to the top; you unlock part of the map for the area you're in. These also unlock fast travel points so you can get around the huge over world a lot quicker than if you walked everywhere. Also on land are a variety of things to gather such as sea shanties, animal skins, fragments and treasure chest loot crates. There's also a variety of side missions that you can take on, most of them are assassination quests, but sometimes its missions to free slaves or recruit new crew members. 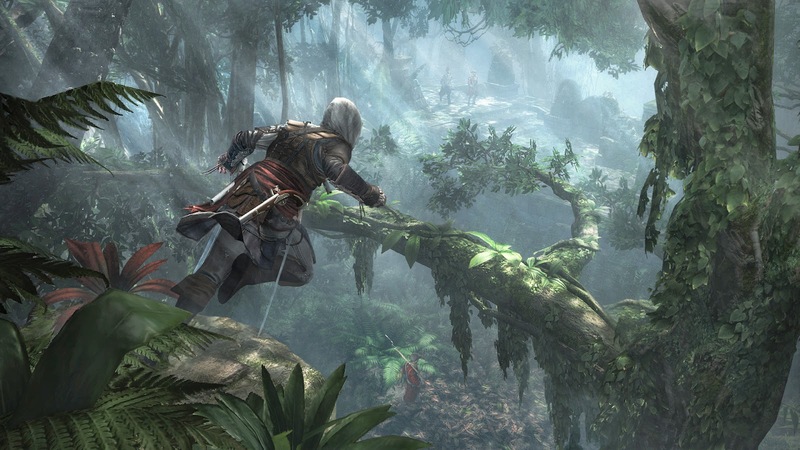 Until you unlock some fast travel points around the numerous locations in the Caribbean, the vast majority of your free time will be spent roaming the oceans in the Jackdaw, Edward's trusty pirate ship, and again if you've played AC3 you should already know how it's going to feel. For the uninitiated, the ship handles very well, depending on your speed, the faster you're moving the wider your turning circle. Wind speed and direction, as well as waves also affect how quickly you can get from island to island. There's also ship to ship combat, as you progress through the game you can gather materials and funds to improve your ship so you can take on larger vessels, once you damage an opponent enough you can either choose to sink it or try boarding it for a greater reward. Multiplayer consists of 2 main game types, Wolfpack and versus. Versus game types have been present in the series since AC2 Brotherhood and nothing has really changed much with the different modes on offer, but with Black Flag you now have Game Lab, this is used to handcraft your game play experience any way you like. You can change practically every aspect of how you go about finding targets or setting specific weapons you must use or just go right back to basics and only use the hidden blade. In my experience playing in other people's games, it's just not as fun as the standard multiplayer because you have to learn a whole set of new rules with someone who's invented the game type and you often come out worse off for it. Wolfpack mode is my choice of multiplayer, playing with up to 3 friends or random people; you have to chase down targets to assassinate as well as some random objective waves thrown in to mix things up. This game type is more fun with friends as it's easier to coordinate simultaneous assassinations, whereas playing with random people can and often does end up with everyone sprinting about trying to get all the kills. The only issue with this is later waves are unlocked via a scoring system, and being stealthy earns you a vastly higher score than if you're careless. I originally played Black Flag on the 360, it was only when I got an Xbox One that I could really compare the two and to be honest, I can't really see much of a difference between them which is a more a testament to how great the game is on last gen systems, so whatever format you're getting it on, it's all good. As well as the usual clashing of swords and old timey flintlock pistols, the sound in the game is of a high standard. One of the nicer touches is the sea shanties; as you sail around your crew entertain themselves with a hearty song or two. If you connect with smartglass, you can even get the words up on your second screen and sing along! Sailing around a massive ocean littered with islands to fully explore is just as stupidly fun as it sounds, throw in the brilliant ship to ship combat and you've got a dream of a pirate sim on your hands. Unfortunately I was a tad disappointed with the lack of assassin-ing you actually get to do and the stealth elements still have a lot to be desired, you're either perfectly blended crouching in a bush or your standing up for everyone to see, and most skirmishes always end up with you being forced to murder a huge amount people just so you can go back to your business, as trying to run away to escape invariably fails.